Content is a smart strategy to help you grow your business. Gwynneth Paltrow’s company Goop used in-depth contentto triple their year on year growth in 2017. And luxury health club chain Equinox created a new revenue stream with Furthermore, their content sub-brand, which provides recipes, workouts, and videos to help you get fit. Here’s one counterintuitive approach to help you figure it out. 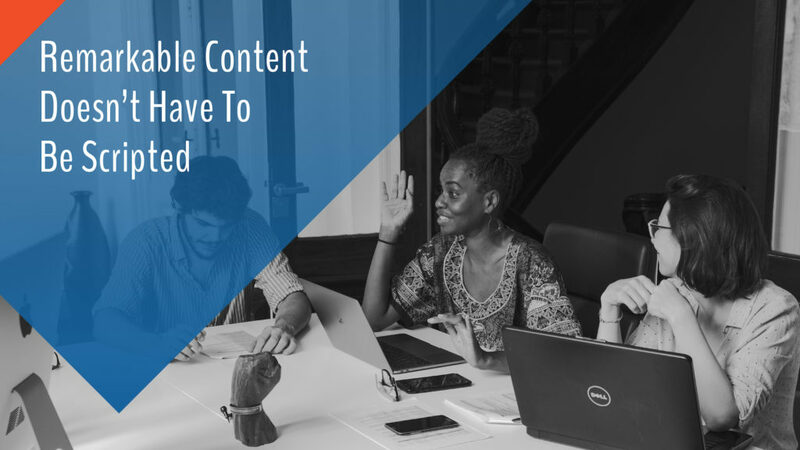 Instead of planning all your content in advance, start capturing unscripted content and material as you go about running your business, and then figure out what to do with it. I spent the last few months working on a big media project for my business. In the process, my team captured a ton of photos and video clips. Only about ten percent of the content I have will be used in the official project. But as I sorted through all the extra photos, video footage, and behind the scenes material, I discovered a ton of different ways I can use the “extra” content in a way that will advance my business goals. Actor Will Smith uses this approach as well. He travels with a photographer and videographer. At times, there will be specific activities and events he’ll want them to focus on capturing. And other times, the magic comes from the “life” that happens when the cameras are on. Here’s an example of a piece of content he published on his Instagram account, that was born out of this approach to capturing material. I watched it giggling at least five times. The best stories often come from real life. Here’s how to capture real life for your own business, as a base for producing content that draws your ideal customers closer to you. I just finished reading Kobe Bryant’s new book The Mamba Mentality. In it, Bryant walks through the mindset he developed that helped him build a story-book 20-year basketball career, complete with five NBA championships and two Olympic gold medals. When Bryant first started working with the photographer, it’s likely he didn’t know he’d be using those photos as a core part of a book he’d release after retirement. But when he decided to begin the project, because he’d been taking photos, he had an asset that helped elevate the quality of the finished work. You don’t have to be like Gary Vaynerchuk and hire your own DRock to follow you around capturing your every move on camera. You don’t have to become a reality star either. Plan out a project that requires the use of video. Then make sure you bring someone on to capture behind the scenes footage of the unscripted content. Once you develop the habit of seeking out ways to use content, even in microformats, you’ll have an endless amount of material to use. Rethink your idea of what good content is. Don’t limit yourself to only traditional forms, such as blog posts and podcast episodes. Inspiration and ideas to generate remarkable content your customers want to devour are all around you. Your job is to be ready to capture that inspiration in real-time when it happens, so you can deliver delightful unscripted content that grows your business.